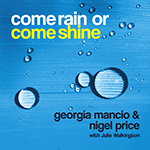 About Georgia Mancio - opening for Kenny Barron, Georgie Fame, Monty Alexander, Jon Hendricks, Cedar Walton, Joey DeFrancesco, Ramsey Lewis, Steve Smith, Lee Ritenour, Dave Gruisin, Ray Gelato, Dave Holland’s Overtone Quartet and Milton Nascimento whom she also interviewed for Ronnie Scott’s International Jazz Radio Show. Georgia’s ongoing projects include a duo with the multi award-winning singer and pianist, Ian Shaw; a duo/trio featuring Parliamentary award-winning guitarist, Nigel Price; a quartet/quintet with flute supremo, Gareth Lockrane, and stellar pianist, Tim Lapthorn and a bossa nova sextet Salud a Tom Jobim featuring reeds player, Mark Crooks. She has completed 5 national tours and released 4 albums (Peaceful Place, Trapeze, Silhouette and Come Rain or Come Shine) on her own label, Roomspin Records.BBC Radio 3’s Jazz Line-Up have twice broadcast her live concerts: with Darius Brubeck in 2011 and with John Parricelli in 2013. 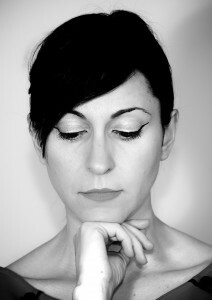 She has also collaborated with: Liane Carroll, Jason Rebello, Gwilym Simcock, James Pearson. Jim Mullen, Nikki Iles, Jim Hart, Laurence Cottle, Michael Janisch, Kate Williams, Bobby Wellins among many others and is featured vocalist with Frank Griffith’s Nonet. In 2005 Georgia beat contestants from all over the globe to take first prize in the Brussels International Young Jazz Singers’ Competition. She launched ReVoice! in 2010 in association with the Pizza Express Jazz Club. Now a much lauded annual event which Georgia produces, presents and performs in, ReVoice! has hosted stars including: Tuck & Patti, Raul Midon, Gregory Porter (his first UK booking), Beady Belle, Carleen Anderson, Carmen Souza, Karin Krog, David Linx, Maria Pia de Vito, Jhelisa Anderson/Robert Mitchell, Mycale (John Zorn’s a capella quartet), Kevin Mahogany, Allan Harris, Becca Stevens Band, Sofia Rei and Diana Torto/Kenny Wheeler/John Taylor.